we had dinner just in time last night - there is a caravan club also staying at this park and generally the rule is individual caravaners are nice, collectively they are absolutly ignorant bastards (Neils words not mine!). We sort of guessed that they were going to come up and use the bbqs which is fine as we weren't using it so we started our dinner of packet curry and 4 bean mix! and they start coming up to cook and off course they always have to comment on everything including us and then more come and realise we have one table so they start to bring up their chairs and tables and start putting them out and around the kitchen ... completely ignorant of the fact that they are now about 2m from our tent and encroaching on our site. They are everywhere so we quickly eat our meal, pack up and finish. Meanwhile they are everywhere! Now I have no problem with them using the communal kitchen but I do have a problem with them bringing up their chairs and tables and settling themselves in the unpowered section and being rowdy and loud. How would they like it if we came down and plonked ourselves near their sites and became rowdy and loud? They would be very quick to complain! So onto todays ride to Red Cliffs. We had decided to get up early so that means in the dark and lucky for the kitchen as it had a light and we quickly had brekky and packed up and was on the road at 7.40am ... a record. I think about it at the end of the day and we were probably the first on the road this morning and one of the last to get off since we are so slow! We also wanted to get to Red Cliffs so we can listen to the Geelong vs. Hawthorn game (Geelong by 2 points at 3 quarter time!). We both felt good and strong although I can't say if we feel like that after 90 odd kilometers! A beautiful sunrise this morning and a clear sunny start which eventually end up being cloudy and cool - great riding conditions. No wind at all today until maybe around lunchtime but even then still gentle and the road is protected by mallee scrub either side of the highway. Anyway at 8am in the morning there is no one going our way and everyone is coming out of Mildura - the first ones we see are the early birds that probably want to get back to Melbourne so they don't get stuck in traffic. They come in dribs and drabs and then they come in convoy groups, meanwhile no one is passing us! It is a bit like those end of the world movies where there traffic flow is all going one way out of a city and there is the lonely hero/ine going in the opposite direction! Well that soon changed - at about 11am to 12.30pm the traffic started to become heavy in the direction we were going and it was all vans, caravans and campers - we assumed they were waiting for Mildura caravan parks to empty and for them to replace them. So at that point traffic was heavy in both directions! We have to admit along the Calder highway was like a 'shopping mall' for Neil - so many road kills - 2 sunglasses, a knife sheath (which proved useless) and a Qantas toilet bag which will make a great computer gadget bag. Neil was smiling from ear to ear. He saw other things like an empty wallet and a broken phone but didn't bother with them. The caravan park still has people here, although there are a lot of empty sites which is good. Behind us is a vineyard and I am going to assume they are for eating rather than wine. The park is nice, expensive at $25 for unpowered. It does have a camp kitchen but that is only open at 8am in the morning which is not good for us - too late. But we have not much food left with us after this easter. The shower wasn't the greatest - it took nearly 3 mins for warm tepid water to come through and another 2 mins for hot water to come through and then you are bombarded to water saving notices throughout the toilet block ... go figure?! 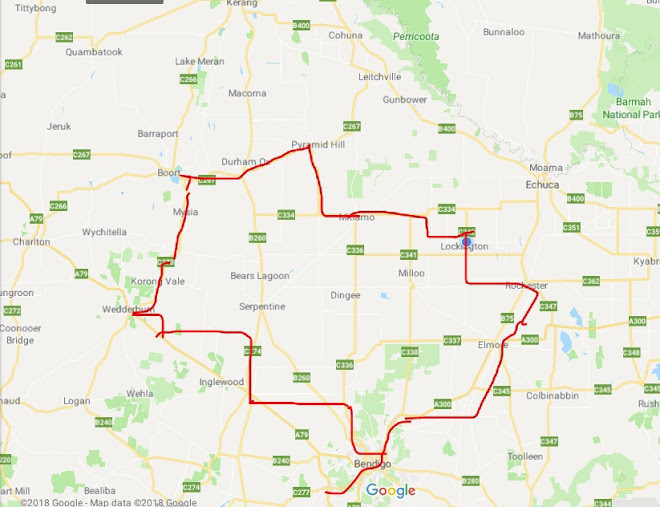 Tomorrow is a smaller day - around 45kms to Wentworth where we will stay for a rest day.